The Bangladesh Coast Guard service continues to expand its fleet with new patrol boats that are being built at local naval shipyards including Khulna Shipyard (KSY) and Dockyard & Engineering Works (DEW) in Narayanganj. Both yards are Bangladesh Navy-owned entities. KSY was due to deliver the first of three Sonar Bangla class Inshore Patrol Vessels (IPVs) to the Bangladesh Coast Guard by the end of December 2018. The IPVs are a modified version of an earlier series of five Padma class patrol boats of Chinese provenance that were built by KSY for the Bangladesh Navy between the 2011 and 2013. According to KSY, the Coast Guard signed a three-ship IPV contract in July 2016. In turn, KSY signed a contract valued at approximately US$26 million with its Chinese partner, China Shipbuilding & Offshore International Company (CSOC) in August 2016. The latter contract is for the design, supply of material packages and technical support for the IPVs. As with other patrol vessels of Chinese provenance that have been constructed at Bangladeshi shipyards, the ships are being constructed to China Classification Society (CCS) standards. The contract called for the delivery of the first hull within 24 months of contract signing – by July 2018 – but delivery has been pushed back by a few months. KSY commenced construction of the IPVs with a keel-laying ceremony for all three hulls on 2 October 2016. The first hull was launched as Sonar Bangla with pennant number P 204 on 23 May 2018. The second hull, Aparajeyo Bangla, was launched with pennant number P205 on 5 August 2018. 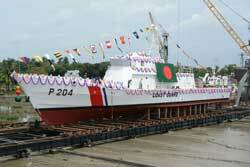 The third unit in the class, Shadhin Bangla, pennant number P206 was launched on 30 October 2018. The IPVs have an overall length of 51.2m, length between perpendiculars of 48m, beam of 7.5m, baseline draught of 1.94m at full load and 2.00m at maximum load. They displace 280tons under normal loading conditions, 297tons at full load and 305tons at maximum load. Unlike the Padma class, which have four propeller shafts, the propulsion system on the Sonar Bangla class comprises two propeller shafts each driven by a MTU 12V4000M93 diesel coupled to a ZF 7600 gearbox. The new units have a maximum speed of 23knots and maximum continuous speed at full load of 20knots. Range at a speed of 15knots is 1,500nm. A total of 100kW of electrical power is generated by two Kohler diesel alternators. The IPVs have a complement of 45 people. Their armament consists of two Chinese-origin remotely operated 30mm H/PJ-17 (or HJ-17) gun mounts, two 14.5mm heavy machineguns and two light machineguns. The sensors installed include two Furuno navigation radars. Apart from the Sonar Bangla class IPVs, in August 2018 the Bangladesh Coast Guard took delivery of four patrol vessels that were built by DEW in a technical partnership with another large Chinese shipbuilding group, China Shipbuilding Trading Company (CSTC). Two of these are 51.4m, 297ton Shobuj Bangla class IPVs and two are somewhat smaller 43.4m, 235ton Sonadia class Fast Patrol Boats (FPBs). The vessels were built by DEW within a span of about three years between 2015 and 2018. DEW is also building two slightly larger 52.8m, 315ton IPVs whose keel laying ceremony took place on 12 December 2017. The specifications of the DEW-built IPVs match those of the KSY built IPVs – a maximum speed of 23knots, range of 1,500nm and a complement of 45. However, there are detail differences between the two classes of IPVs. The seven IPVs and two FPVs are part of the Coast Guard’s ongoing, multi-phased capability expansion plan which seeks to develop it into a ‘two-dimensional force’ replete with an air arm by 2030. Apart from the IPVs and FPVs, 12 small high-speed boats (HSBs) are also being built for the Coast Guard at KSY and DEW with deliveries expected to take place in 2019. In November 2017, KSY commenced building six 15.4m HSBs to a design thought to be from KND in South Africa. DEW is also building six Stingray (X-12) composite-hulled craft under a technology transfer deal with Indonesia’s North Sea Boats. These 11.7m long, 35knot composite hulled craft were designed by New Zealand-based LOMOcean. Both HSB types are being built to Bureau Veritas standards. In addition to the patrol vessels, auxiliary vessels currently under construction for the Bangladesh Coast Guard include a floating crane and two Damen tugs at KSY. All these projects are slated for completion by mid-2019. As of mid-December 2018, the Coast Guard in the country operated a fleet of four 87m offshore patrol vessels (ex-Italian Minerva class corvettes), three IPVs, four elderly Tanveer class coastal patrol vessels, four fast patrol boats and five elderly riverine patrol vessels as well as more than 100 boats which are 15m or less in size. These platforms are used to patrol a 710km long coastline and an exclusive economic zone covering an area of 118, 833km2. Plans include the installation of a long-range identification and tracking/vessel-trafficking monitoring system as well as the acquisition of pollution control vessels, more offshore patrol vessels and patrol vessels both large and small, in addition to high-speed boats, hovercraft, unmanned aerial vehicles, helicopters and maritime patrol aircraft in a phased manner by 2030, along with the requisite expansion in personnel numbers.